There is a fundamental problem with the logic of steps (1)-( 3) as outlined above. At issue is the use of inconsistent system boundaries. The fossil fuel system of step (1) is physically different from the biofuel system of step (2) because the fossil fuel system does not include ecologically productive land. So the common logic compares a system of fossil fuel production and use, which lacks productive land, to a distinct system of biofuel production and use that does include productive land. In other words, it involves an "apples to oranges" comparison, leading to an incorrect conclusion. The crux of the issue is the need for consistent treatment of land within the system boundary. Note that we're not even talking about land-use change at this point, we're just addressing the carbon flows on existing productive land. In this context, "productive" means land that has some level of positive net ecosystem production (NEP), i.e., an area of the biosphere that, on balance over the course of a year, removes more CO2 from the air than gets released from that same area through plant respiration or decomposition. Any harvested cropland has strongly positive NEP, the vast majority of which is the carbon embodied in the harvest. However, farmland removes CO2 from the air regardless of the disposition of its harvest. Therefore, shifting the use of the harvest (say corn or soybeans) from a prior use (as feed or food) to an energy use (such as ethanol or biodiesel) does not itself change the rate at which the land is removing CO2 from the air. Now, there will be displacement effects, that is, the need to make up the food or feed use displaced for fuel use by growing replacement crops somewhere else, or through a reduction in food consumption. Displacements can be partly offset with coproducts, such as DDGS used for feed. The displacement effects will change net CO2 releases in other locations, but estimating those changes requires complex economic modeling as done by EPA and others who compute lifecycle GHG estimates for fuels. Such displacement effects can also lead to land-use change, which is even more difficult to quantify and serves to further increase the uncertainties regarding net impacts. But let's return to the core carbon cycle logic, this time using a consistent system boundary that always includes productive land and represents a single physical system that incorporates both the biofuel supply chain and the fossil fuel supply chain. Without getting into either processing emissions or displacement effects, does substituting a biofuel for the fossil fuel reduce CO2 emissions, and if so, where? Well, there is no change in how much CO2 is removed on the land; it's the same regardless of the where the harvest ends up. At the same time, there's no significant change in CO2 released from fuel combustion, because similar fuels release essentially the same amount of CO2 per unit of useful energy. So, to first order, the substitution of the biofuel for the fossil fuel results in no net change in the amount of CO2 flow to or from the atmosphere. Yes, some fossil carbon stays in the ground, but a net reduction can only occur if more CO2 gets removed from the atmosphere somewhere else. But that does not happen if land that is already in production is used to grow the feedstock, as is the situation for the vast majority of biofuel produced today. Are there circumstances where biofuel use can reduce CO2 emissions? Yes, of course, and what's required is a demonstrable increase in the net rate of CO2 uptake where the feedstock is sourced. But that's not happening anywhere at commercially significant scale. That is to say, the threshold condition for a biofuel to have a CO2 mitigation benefit is that the production of its feedstock must raise net ecosystem production. The failure to correctly address this condition is a fatal error at the heart of the lifecycle models used by many bioenergy researchers and policy makers. 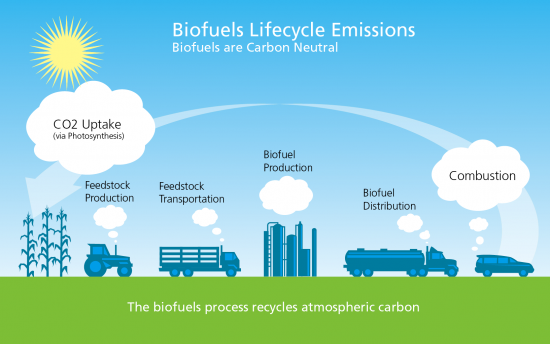 Editor's note: see also the newer post, When do biofuels really balance carbon?